Ms Price’s condition is described as “serious” and her family has expressed deep concern about her deteriorating physical and mental health. In June Price was moved from Hydebank prison to a unit of Belfast City Hospital, where she was receiving treatment for severe depression. But her health has continued to fail. On Tuesday she was diagnosed with pneumonia and moved to the main hospital. Campaigners have urged activists and supporters to help organise an international human rights campaign to pressurise the British establishment into immediately freeing Ms Price. The prison authorities boarded up the windows of her intensive care room in hospital until the staff protested against it, said Geraldine McNamara, National PRO of Republican Sinn Féin. “Unless immediate action is taken to save Marian’s life, she, like Giuseppe Conlon in 1980, will die a prisoner, another innocent victim of British ,” she said. Her husband, Jerry McGlinchey, said: “We’re extremely worried. Marian has been in constant pain for months. Ms Price was charged with encouraging support for the Real IRA last year, and subsequently interned without trial by British Direct Ruler Owen Paterson. 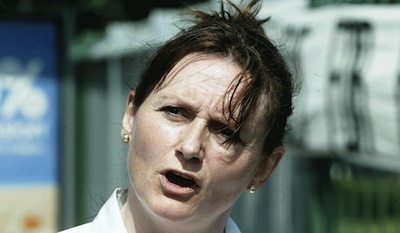 Sinn Féin’s Jennifer McCann said her party had confirmed the deterioration in Marian Price’s condition. “It is unacceptable that despite being moved from prison that she remains in custody with her historic licence still revoked,” she said. “It has long since passed the time when the British government moved to show some genuine compassion in this case and reinstate Marion Price’s licence and allow her to return to the care of her family without any further delay.